New York City is one of those places that takes some getting used to. If you are from there, people like me would probably annoy you because I am trying to find my way around and figure everything out. The idea of road testing a car in Manhattan is an interesting one. Driving around the city is unlike anywhere else and takes patience, skill, and you have to be a bit daring. The 2014 Mazda 3 is a car I've never driven before. Before taking delivery, I didn't know what the buttons did, how it drove, and I was also missing that spatial awareness you get after driving a car for a few days. Mix that with driving in NYC, and you have an interesting combination. Our time with the Mazda3 was interesting, and here is what we found. The 2014 Mazda3 is all new. We have been seeing it everywhere from commercials during the Olympics to every media outlet reviewing the mess out of it the past few months. I even passed two billboards in Akron on my way to the airport, showing off the all new red hatchback. So it's safe to say Mazda has been pushing it pretty hard. The excitement leading up to this drive was building on our end as well. When requesting a vehicle from Mazda for this story, we had two requirements. We wanted something of manageable size and also GPS. Navigating around Manhattan with a full size SUV and no GPS is not my idea of fun. The MX-5 was off the table, as some random journalist apparently wrecked it... The Speed3 isn't being made currently, and the Mazda2 wasn't available. 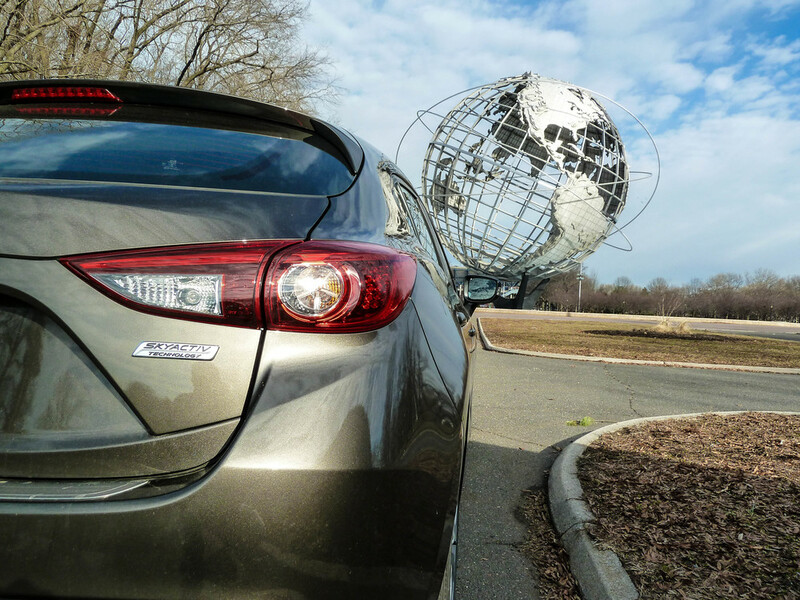 By default, we were offered up the 2014 Mazda3 with navigation. We arrived to pick up our vehicle and were instantly disappointed. The billboards and ads showing off this great red hatchback were almost a tease considering we were given the "Titanium Flash" colored version. This color really fit in well with the dull and dreary New York sky of mid March. It isn't a bad paint color, but for this review it just didn't get us super excited to hop in and zoom around Manhattan. The Soul Red exterior would have really been fitting considering you see it advertised everywhere. The body and chassis are all new from Mazda. The wide mouth corporate grille look has been refined and improved with gloss black and active shuttering. For a hatchback, Mazda has done a great job giving it striking features and little hints of excitement. The two little bulges on the back of the roof are a nice little touch of uniqueness. This day in age though, if you are looking for a vehicle that is kind of exciting to drive and sporty, the hatch is it. Most times now, the sedan model isn't the one you want. The sedan just screams middle aged family car even though it looks very similar and has great styling. Overall though, I found fit and finish to be top notch and once again the auto industry just knows what they are doing. No longer do you have to buy a simple hatchback and expect it to be junk. It is getting harder and harder to find a car that has something wrong with build quality. Some of the other exterior features were 18" wheels, Bi-Xenon headlamps, dual chrome exhaust outlets, and LED lighting front and rear. Great job on the styling and exterior looks by Mazda, I just wish the paint wasn't so drab and dull. The interior color of this 3 was called Almond. 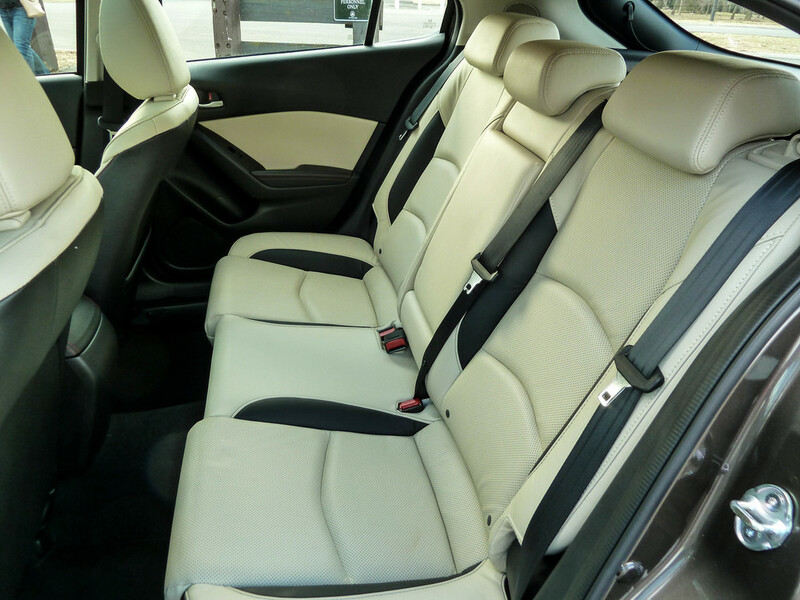 The leather seat skins had an off white color with darker trim and plastic surrounding them. They felt nice and were comfortable, but to me I don't know how many they will sell. This is one of those interior colors that seems to be meant for auto shows and magazine photos. It looks good, but practicality and longevity are what I wonder about. The Almond color reminds me of the Chevy interior color they started making called "Brick" - It looks good in theory, but how many are actually sold? This particular Mazda3 was basically optioned out with everything. Dual-Zone climate control, keyless ignition, Bose 9 speaker audio system, paddle shifters, the Active Driving display, and of course the 7" touchscreen with navigation. We will get into all the tech features later on. Interior again was built and put together really well. Everything had a solid feel to it and quality was not sacrificed in any way. Mazda did a nice job of making plastic trims look metallic and putting piano black in certain places. I will complain slightly about the touchscreen placement. The screen sort of just plunked down on the dash looked a little tacky. I'm not sure where else they could have put it, but the dashboard design looks almost like they forgot about a screen. The standard radio is placed in the same spot, just not as prominent. Our testers 7" screen really stuck out and looked like it should almost be a removable piece that could be taken down for security reasons. 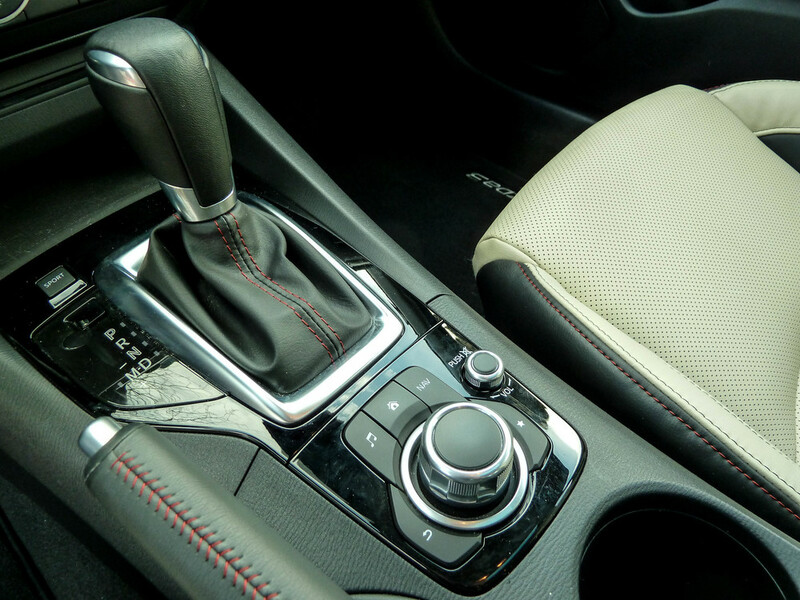 Our 5-Door, Grand Touring model was given the 2.5L DOHC four cylinder with a six speed automatic transmission. The engine is an all aluminum design with variable valve timing; 184hp and 185 lb-ft of torque. For a 3,000lb vehicle that is more than enough power. Mazda has designated this the Skyactiv-G engine along with the Skyactiv-Drive transmission. According to them, this engine is the worlds first mass produced engine with a compression ratio of 14.0:1 - the 6 speed offers a wider lock-up range that allows better torque transfer. Let's just say that the drivetrain is all new and better than ever. To round out the new engine/trans combo are four wheel disc brakes with ABS, independent front/rear suspension, and electric powered rack and pinion steering. There really is a lot going on with this car and you won't be disappointed with the amount of features that come on the Grand Touring model. As we stated earlier, this review was done in the city. Manhattan was the plan and after the photo shoot at Flushing/Corona Park in Queens we were on our way. The first thing I noticed about the Mazda was power. It really moved when I wanted it to and pressing the Sport button made everything more dramatic. Sport Buttons always seem a bit gimmicky, but on the 3 I found it to hang in gear longer and have the power ready with a quick throttle jab. This isn't the type of car you just jump in and go though. I'm starting to find the amount of tech in vehicles is actually making driving more dangerous, even though it's meant to keep you safer. Presetting all your stuff before you set off takes some time and doing it at stoplights isn't a great idea. The GPS wasn't setup correctly from the previous driver so we were getting directions on the screen but no voice commands. Once that was sorted out, the Manhattan driving adventure had begun. If you do any sort of fumbling with your iPod, sightseeing, or anything other than driving in the city, your fellow drivers let you know. Basically, you are in their way and get moving. So that is what the 3 did for us during this test. Quick take offs at stop lights, weaving in and out past taxis, hard braking, and of course squeezing down tiny streets. I found the 3 to have enough power to get from block to block and light to light. Blind spot warnings were dinging constantly and the side mirrors had small indicators to let me know I was about to crash. During the city driving, the 3 did everything I could ask of it and more. Handling was crisp and it was easy to maneuver around anything and anyone. Our test car had one issue though that I believe raised stress levels during this city driving. Mazda plated this vehicle in California, so we were the idiots from California driving around the city. Even though we are from Ohio, I feel the California plates got us tons of extra honks and dirty looks as we zipped around Manhattan. Infotainment and tech features are super cool. I absolutely love having my iPhone synced up and all working perfectly along with a slick gauge setup and power everything. It all will eventually break I'm sure, but I still love this stuff in a car. Our tester had tons of it including the 7" navigation screen, Active Driving Display, Bluetooth, HD Radio, Pandora, USB Ports, SD Card slot, push button start, and the Commander Control which puts it all at your fingertips. The navigation was something we needed for this drive. When it came down to it though, I found it focused on all the wrong features. During our drive, it crashed multiple times and also froze up a few as well. GPS in the city is known for being awful, but I didn't expect it to be this bad. There were times when driving for five blocks offered up no signal and no directions. 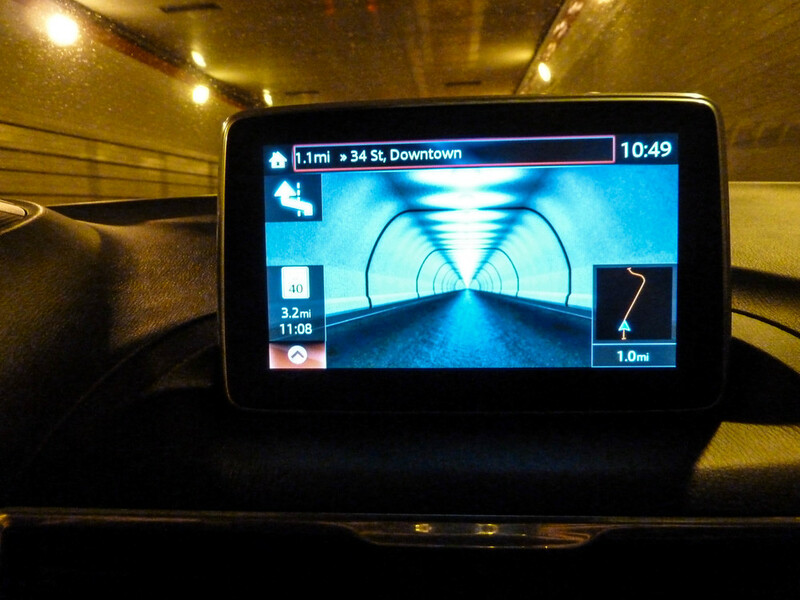 The navigation did have some cool features like showing 3D landmarks/buildings and even showing the interior of a tunnel as we were driving through the Midtown Tunnel. I think it needs some bugs worked out to be perfect. The command control knob by the center console worked very well though. It reminded me of the BMW iDrive knob sort of thing. It spins, can be pushed down to select, and also can be clicked in different directions. It made using the system pretty simple if you are too lazy to reach up and touch the screen. There is so much tech on this car though, seriously tons. I really didn't get a chance to try it all because of the location we were driving. NYC is not distracted driver friendly, the mission on this trip was driving and getting to where we needed to go. Having the 3 for a longer time period might give us a chance to really get down to it and see what works and what doesn't for a five door hatchback. We will see if we can arrange that and run some tests on the various other items they are now offering in terms of safety and convenience. Our time with the Mazda3 was short and sweet. A five door hatchback is something that has become a necessity nowadays because people have junk to haul but don't want to waste the gas in a van or SUV for various reasons. Automakers can't really crack the station wagon market and at the same time people want something sporty. The five door hatch fits right into this area, and you can tell people are buying them based on the number of five door models out there in the various companies. This 3 raises the standard on all of them. When car buyers go to compare a few models, the 3 will more than likely come out on top. With all the features, safety, options, build quality, and styling - most people are going to end up leaving the Mazda dealership in a new 3. If I had my choice though, I'd pick any color other than the Titanium Flash. Build Quality is amazingly good. Options & Features are plentiful - You really have a lot to play with. Styling - Proves a 5 door hatchback doesn't have to be lame. Navigation was pretty rough - At one point I was using my phone instead of the 7" dash mounted screen. Tires - For some reason this tester was equipped with Blizzak LM-22 winter tires.. They had a tough time getting traction on totally dry pavement. Active Driving Display - Gimmicky, Cheap, and yet another thing jutting out of the dash. A feature that is only there for photos and commercials.